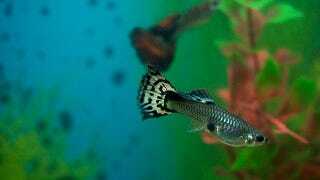 Scientists have tried to understand why guppies are so prone to infanticide and cannibalism. At first they thought it was a simple way of population control. While it’s true that guppies are more likely to eat their babies (often right after they’re born) if they’re starving or crowded, the need for cannibalism to curb an expanding population is overstated. Guppies can often slow their growth in times of scarcity, making each baby less of burden. At the very least, mothers should only go after the babies of other guppies. Instead, they reliably eat their own. There’s a wide range of cannibalism in both populations and individuals. There are guppies who habitually attempt to become fry-eaters but aren’t very good at it and there are guppies who are less likely to eat their children, but who are very very good at it when they do decide to go cannibal. There are babies that escape parental predation better in open environments and babies that do better when they’re given a place to hide. The only thing we know for sure is guppies have managed to create a rich mosaic of different types of cannibalism. Cannibalism of the young is just disturbing to pet owners, but it’s a real economic problem for guppy breeders. Some have success with a little screened-in area that the grown-ups can’t get to—provided they leave a light on near that area so the babies will gravitate towards their safe spot. The technique has, however, limited success. There doesn’t seem to be a way to keep guppies from their snacks other than separated the babies out quickly.